Here at Farnham Common Nurseries we stock native hedging and also import a range of bare root and balled trees along with large evergreen hedging plants. which are available from October, to March. 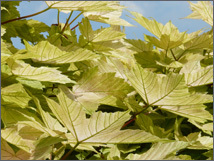 We stock a wide selection of trees ranging from Acers to Liquidambers. There are varieties for all types of garden from the small plot, to the large one, adding colour, either by flower, foliage, or berries, for most of the year. If you would like any additional information about any of the trees we stock as well as our delivery service, please feel free to contact a member of our team today by phone or completing our online enquiry form.